"There is then scarcely any doubt that the Russian Revolution, which broke out a year after the above information reached us, was worked up and launched by distinctly Jewish influences." "In fact in April, 1922, Jacob Schiff made a public declaration that it was thanks to his financial support that the Russian Revolution was a success." "(II) In the Spring of 1917, Jacob Schiff began to commission Trotsky (Jew Zionist) to bring about the actual Social Revolution in Russia, the New York journal, 'Forward,' a Bolshevik daily gazette added also its own contribution to the same source." "From Stockholm the Jews, Max Warburg in the same way commissioned Trotsky & Coe: they were also commissioned by the Rheinish West-Phalian Syndicate, an important Jewish concern as also by another Jew. Olaf Aschberg and the Nye Banken of Stockholm, and also by Jovotovsky a Jew, whose daughter married Trotsky. Thus established the relations between the Jewish multi-millionaires and the Jewish proletarians." Space will not permit printing the detailed lists of the Russian Politburo, Diplomatic Corps, Soviet military Establishment and the Soviet Secret Police (KGB) showing them to be filled overwhelmingly (over 90%) by Jews. These lists were put together a few years ago by A.F. Karlow-Dalimilov a Russian patriot. The names of prominent "Russians" appearing in the public eye are nearly all phony, like Andrey Andreyevich Gromyko, onetime Foreign Minister, real name Katz and Kruschev, real name Pearl-Mutter. A Russian living in exile in Britain wrote; "Every corrosive and pernicious influence on society can be traced to these same people. The Talmud is a blueprint for paedophilia. May God preserve the Russian nation and the British (long our natural allies) from these devils. The Zionist Jew orchestrated the murder of Our Imperial Family and the crucifixion of Russia from 1918 to 1991. Now we have rule by Capitalist Jews as opposed to Communist Jews but we can be sure whoever the "Government" (and I use this term loosely) is that it will dance to the tune of the Jew World Order." Major General Count Cherep Spiridovitch, a member of the old Russian aristocracy, wrote "Evil is enthroned in Moscow. The promoters are not Russians; they are Jews...." All the Jews changed their names into Russian. The Secret World Government or Hidden Hands first published in 1926. The Russian General, Arsene de Goulevitch, in his book Czarism and Revolution confirmed that it was Jewish Bankers who financed the "Russian" Revolution. The financing was handled by a syndicate of International Bankers which included J .P. Morgan and Rockefeller interests, and Lord Rothschild spent over 21 million rubles in financing the "Russian Revolution." "The financiers' participation in the Communist take-over of Russia was well known among Allied Intelligence Services, but not a finger was lifted to stop them because they are the real masters of the world." F. J. Irsigler, Who Makes Our Money. The Dutchman William III and his Queen Mary, who was the daughter of James II, came to the throne in 1689, The King and Queen were made to promise in a solemn "declaration" that they would never claim a "dispensing power" or try to set aside or overthrow the law and THAT THEY WOULD NEVER RAISE MONEY WITHOUT THE CONSENT OF PARLIAMENT or keep a standing army in time of peace. This was made the law of the land by Act of Parliament and called The Bill of Rights. It was the driving object of William's life to oppose and defeat the power of France which had so long threatened his native Holland. Always short of money in his war against France, in 1694 he borrowed £1,200,000 in gold from the Jewish Money Changers at 8 per cent interest to be repaid a year later. They only agreed to lend him this money on condition that he gave his royal permission for them to establish a "Bank of England" and print for themselves an equal amount in bank notes. Thus, he really agreed to pay them 108 per cent interest on their original loan. William Peterson, a spokesman for the newly formed "Bank of England" declared "THE BANK HATH BENEFIT OF INTEREST ON ALL MONEY IT CREATES OUT OF NOTHING." All unpaid loans plus accumulated interest since 1694 forms the NATIONAL DEBT. The National Debt has grown to astronomical proportions and can never be repaid but the people are taxed up to the hilt just to meet the interest payments on this absurd debt. Obviously, if the Government created its own money in the first place interest and debt free, there would be no National Debt and very little need for taxation. The Government wouldn't forever be short of money for the NHS, education and the military, etc. Oliver Cromwell 1599-1658, who became Lord Protector of England with much greater powers than King Charles Ist whom he helped to defeat, let the Jews back into England. During the English Civil War Parliament desperately needed money to wage war against their King. Two wealthy Money Changers of Amsterdam, Manasseh Ben Israel and Carvajal, agreed to let Cromwell have all the money he needed to build up the New Model Army and defeat the King. On condition that the Jews be allowed to return to England. As we have seen, just a few years later in 1694 they got their money lending business back into top gear again with the creation of their "Bank of England." The Government becoming the chief debtor and the people of England their financial and tax slaves. In revenge for their expulsion from England, the Money Lenders ordered Cromwell to kill the King. He was allowed to escape, recaptured, put on trial, and executed. Their orders were duly carried out with the connivance of a fixed Parliament. 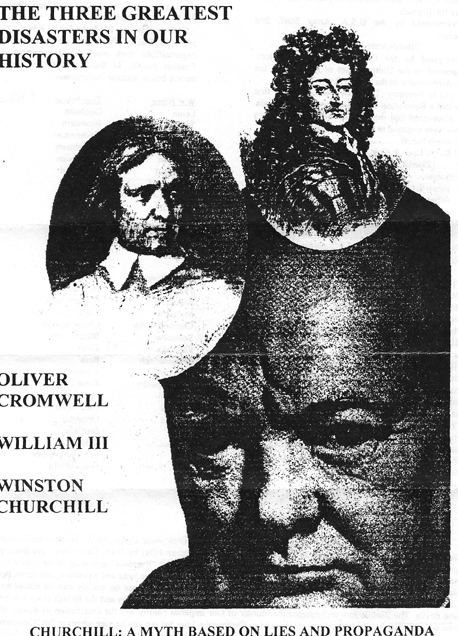 Cromwell's private correspondence with the Bankers discovered in an old library in Amsterdam proves this. Reference. The Nameless War Capt. Archibald Ramsay M.P. It appears that the real reason for the English Civil War, conveniently left out of history books, is that Charles Ist refused to borrow money from the Jewish Money Changers to build up the navy and refused to let the Jews back into England. Parliament would not allow the King sufficient funds to run the country so the King imposed his own taxes like "Ship Money." This finally led to conflict between the Jew backed and financed Parliament and the King. That the King spent "Ship Money" on updating the navy is proved by the building of the"Sovereign of the Seas" launched in 1637 for the cost of �65,586 16s 9-1/2d. She was Britain's first 100 gun battleship and the prototype of every British battleship built over the next 200 years. Charles laid the foundation for Britain's Naval Power. Since 1694 the Jewish Money Changers have INCREASINGLY CONTROLLED THE NATION FROM BEHIND THE SCENES. The Parliament at Westminster is merely a sham-a rubber stamp to enact the will of the Money Changers. Their control of the country is now total. Through all of the mass media-T.V. radio, newspapers, advertising, book publishing, etc., which is TOTALLY UNDER THEIR CONTROL they form, shape, and mould the public mind. Through their control of Freemasonry at the top, they place their stooges and dupes in all the top jobs in the�Judiciary, the Police, Civil Service, education, local Government, etc., people who will serve them and do their bidding. The Jewish Money Changers have been behind nearly all our wars and the revolutions of history. Today, they are the driving power behind MULTIRACIALISM and the fanatical drive to promote miscegenation/mongrelisation to destroy the real British. The Money Changers are carrying out the genocide of the British with the help of THEIR MEDIA AND PARLIAMENT AND THEIR POLICE FORCE which enforces the anti-British RACE LAWS. When he was an old man, Churchill, sat in the corner of the House of Commons public room and a new MP anxious to meet the "great man" walked over and asked him if he would like a cup of tea. Get me a whisky you bloody fool" was the prompt reply. This was typically Churchill. In 1911 Churchill was made First Lord of the Admiralty which put him in control of the navy. He takes credit for having the British Navy mobilised and ready for action when war broke out in 1914. This is just one of a string of myths associated with Churchill. "The British Navy wasn't ready in 1914. British Merchant ships were without proper protection from August 4, 1914 to July 30, 1917. During those three years we lost 60 per cent of our merchant ships and 42,000 officers and men. We had to take that beating just because Churchill didn't keep the Navy up to strength." Commander William Guy Carr. Admiral Sir John Jellicoe and Admiral Madden had tried to tell Churchill that our naval policy was wrong. They both wrote and signed a brief urging the absolute necessity of reallocating destroyers away from the Grand Fleet to protect merchant ship convoys. They stated bluntly that if such action were not taken, we would lose the war. Churchill's false reports had made the public believe that Jellicoe had been at fault at Jutland (the biggest naval engagement of WWI between the British and German Fleets in which the British had come off worse). Immediately after Jutland, Lord Kitchener was lost when H.M.S.�Hampshire was sunk with all hands. Churchill again tried to put the blame on Jellicoe. False and misleading reports, originating with Churchill, caused the bottom to fall out of the Stock Markets in all allied countries. The Jew Financiers and their friends "sold stocks and shares short on all the exchanges. Then just before the corrected reports were issued, they bought everything they had sold back again at half the price." They made millions out of this fiddle. Lord Douglas, the editor of a newspaper called Plain English, had publicly accused Churchill of being in league with the Financiers in issuing the false report of Jutland�which caused the value of shares to fall. He stated that Churchill was paid by the Jew Financier Sir Ernest Cassell for issuing the false report of Jutland. The fact that Churchill never sued Douglas for this accusation strongly suggests that the story is entirely true. Douglas also stated in his newspaper that the German Fleet had been purposely allowed to escape at Jutland. He revealed that a flotilla of destroyers had started our from Harwich to "administer the coup-de-grace to the German Fleet" after Jutland, but they were mysteriously recalled and the German ships were allowed to get away. Admiral Jellicoe told Commander william Guy Carr what had really happened during the Battle of Jutland. He said, "If I had been given information, which was available to the Admiralty at the time, had I been told that the enemy were passing to my rear during the night, the Battle of Jutland would have ended very differently." Vital intelligence about the disposition of the German Fleet was purposely withheld from Jellicoe and his Commanders. Incredible as it may seem, the evidence suggests that the British Navy was deliberately prevented from winning at Jutland and that Churchill used the whole affair to make money for himself and his Jewish friends. As Lord Douglas commented someone at the Admiralty was undermining the British war effort and it wasn't Jellicoe. At a public meeting on the 3rd August 1923 at the Memorial Hall, Ludgate Circus, London, Douglas revealed all the facts he had discovered about the sinking of the Hampshire and the death of Field Marshal Lord Kitchener. The Hampshire was conveying Kitchener and a team of experts to Russia to reorganise the Czarist Russian Army. If Kitchener had arrived and been successful in his mission there would have been no Communist Revolution, the Czar and his family would not have been murdered and Russia would have remained in the war on the side of Britain. Obviously, those who were planning the Bolshevik Revolution had to make sure Kitchener never arrived in Russia. Douglas showed that the Hampshire was not struck by a German mine or torpedo, a Jew called Nathan, then head of our Secret service in Ireland, got a shore gang to put time bombs on the ship when she was lying in the docks at Belfast. In the evening of June 5, 1916, the Hampshire blew up just three miles out from the Orkneys. The lifeboat was soon dispatched from nearby Stromness, but mysteriously recalled and of the ships crew of 600, only 11 reached the shore alive. These few survivors were soon whisked away and never heard of again and those who gave them sanctuary in their homes were warned to keep their mouths shut. Fourteen stokers who deserted ship when they got wind that she was doomed were recaptured and shot at the Tower of London. Several hours before the Hampshire blew up the story was headline news in an Irish Sein Fein paper under the caption "Kitchener goes to Hell." The official account of the sinking of the Hampshire is a fabrication, a tissue of lies from start to finish. With the failure at the Dardanelles, Churchill was forced to resign as First Lord of the Admiralty in June 1915. Churchill was later made Minister of Munitions. In this capacity he had to be in very close touch with Jellicoe. "When Jellicoe met the Cabinet, in October, Churchill asked him by whose permission he had left the Grand Fleet? Jellicoe told him he left on his own responsibility. Churchill then remarked, "If you consider the matter so very urgent perhaps you would be willing to relinquish the command of the Grand Fleet and stay at the Admiralty and solve the problems?" To the surprise of everyone present, Admiral Jellicoe said he would. Those were the circumstances which caused Admiral Jellicoe to leave the Grand Fleet in November 1916 and go to the Admiralty." Jellicoe had a bed moved into his office and had all his meals carried in when he was hungry. He called in all the best brains available to study every suggestion of anti-submarine devices and worked around the clock. "It only took Jellicoe and his staff eight months to correct the mistakes that originated during the six years of Churchill's administration as First Lord of the Admiralty...from August 4, 1917 to November 1918, our losses at sea were negligible." "It was Jellicoe and Admiral Duft who organised the Anti-submarine Detection Investigation Committee to study every possible means to counter attack enemy submarines. That is how ASDIC gear used in WW2 got its name." On Christmas Eve 1916, Jellicoe sent Churchill a personal note by Admiralty Messenger. He told Churchill that because he hadn't been able to spend anytime with his family during the past six weeks he was going home for a few hours to arrange for his children's Christmas. He said he would be back at the Admiralty by midnight. The messenger brought back Churchill's reply. It was scribbled on the back of the original note. "Go home you damn fool and stay home." That is how Admiral Jellicoe left the British Admiralty December 24, 1916. Dozens of people got to know him during the next few weeks because as soon as he got home, he immediately joined up as a special constable and did his regular beat as air raid warden. Churchill's insulting behaviour could have caused a national crisis. Admiral Jellicoe was asked to go back to the Admiralty. Putting his personal pride in his pocket he did as requested." Red Fog Over America. Commander William Guy Carr.